Volunteers can assist researchers to better understand historic and current life cycles of plants and animals, by participating in phenology. There are six million personal observations about bird migrations written down on note cards and stored away in vintage government file cabinets. Collected as part of the North American Bird Phenology Program (BPP), the observations reflect ninety years of data on the migration paths and distribution of birds across North America for a better than ninety year period. Researchers have come to recognize the value of the BPP data as a cornerstone in study of climate change and its effects on birds. The most immediate problem scientists have now is transcribing the data into a database that will be useful for research and they are looking for the public’s help. In a press release announcing renewed interest in the historic data, Coordinator of the North American Bird Phenology Program at the USGS Patuxent Wildlife Research Center says, "These cards, once transcribed, will provide over 90 years of data, an unprecedented amount of information describing bird distributions, migration timing, and migration pathways and how they are changing. There is no other program that has the same historical depth of information that can help us understand the effect that global climate change has on bird populations across the country. When combined with current information, scientists will better understand how birds are responding to climate change and how to develop tools to help manage that change, especially for at-risk species." The effort to document the historic movement of birds in North America was started by Wells W. Cooke in 1880 to better understand and expand the knowledge of their migrations. Renowned naturist C. Hart Merriam expanded the program throughout the United States and Canada through the use of volunteer observers. There were 3,000 volunteers working within the program during the late 1880s and the Federal government kept the program active until 1970. Scientific interest in the bird migration records caused the program to be reopened in 2008. Researchers describe the collection of observation cards as a treasure trove of natural history. Concerned USGS employees kept track of the card’s locations while the program was extinguished. Fortunately they survived the period of disinterest with no apparent harm. Participants in the BPP recorded bird names, location and dates of arrival, departure and peaks of abundance. The cards often bear personal remarks about a significant sighting or event. I have been transcribing cards off and on since March, and I must say, it is VERY interesting to think about all these volunteers, from Boy Scouts, to Park Rangers, to Citizen Scientists like us, all putting pen to paper to note what they were seeing. 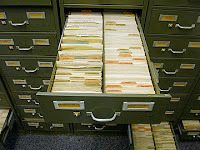 As technology changes there is always the need to bring the old data into the next century. I would hate for these folks' work to be in vain.